This is a review of the product Firm and Tone Serum manufactured by the Murad Company as part of their Anti-Cellulite Treatments line. The company’s website declares Firm and Tone to be an innovative serum that targets not only stretch marks, but cellulite as well. Howard Murad M.D. founded the company, and he has spent four decades with his son Jeff Murad M.D. refining the formulas of his products to deliver results to his consumers. Continue reading to find out if this is the product that will produce results for your stretch mark and cellulite issues. The Murad company website lists no possible side effects. However we found some concerning information when cross checking the ingredients list. A large number of their main ingredients including; Phenoxyethanol, Methylparaben, Perfluorononylethyl Carboxydecyl PEG-10 Dimethicone, Tocopheryl Acetate, Retinyl Palmitate, Linalool, Lecithin and Lactic Acid , were noted to have a moderate to high overall hazard when used in high doses. Some of the hazard warnings include cancer causing carcinogens, developmental toxicity, reproductive toxicity, allergies and immune toxicity. We are in no way, shape, or form saying this product absolutely causes these things in all users. We do however urge you to take into consideration your own personal medical conditions, risk factors, and do your own research to decide if this is the right product for you. The online retail price of Firm and Tone serum is $60 plus shipping fees for 6.75 Fl. Oz. , or if you sign up for their auto-delivery program you will receive a 10% discount and pay only $54 for you purchase when you order from their website. 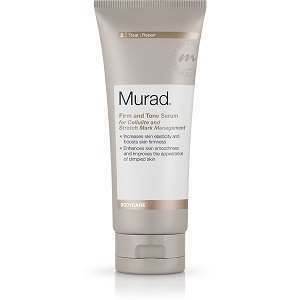 The full line of Murad products is also available at retailers such as Sephora, Ulta and Nordstrom, as well as other online spa product websites. There are a few nice things about their auto-delivery option. First and foremost, you can cancel anytime, so even if you sign up and decide you don’t like it, you can cancel and still saved a little money on your original purchase. Usually with similar auto-delivery programs, the company will force you to renew your stock every 30days, but with Murad you get the option to set up your own delivery schedule. For example, if you use very little of the product and only need to replenish every three months, you may choose to do so. Committed to quality and customer satisfaction the Murad Company offers a 100% refund if you are not completely satisfied with the results of your purchase. Just contact their customer service department within 60 days and they will assign a return #, then you will package up your unused or empty product and ship it back to the company at your own expense. They will process your return and refund your purchase price pus any taxes within 14 days. Overall, Firm and Tone Serum by the Murad Company appears to be an exemplary product that, according to customer reviews, delivers stellar results. This combined with the fact it targets not only stretch marks, but cellulite as well. However, the high price, small amount you receive, and use of possibly harmful synthetic ingredients could have many consumers thinking twice about purchasing this product. David Carney	reviewed Murad Firm and Tone Serum	on July 24th	 and gave it a rating of 4.